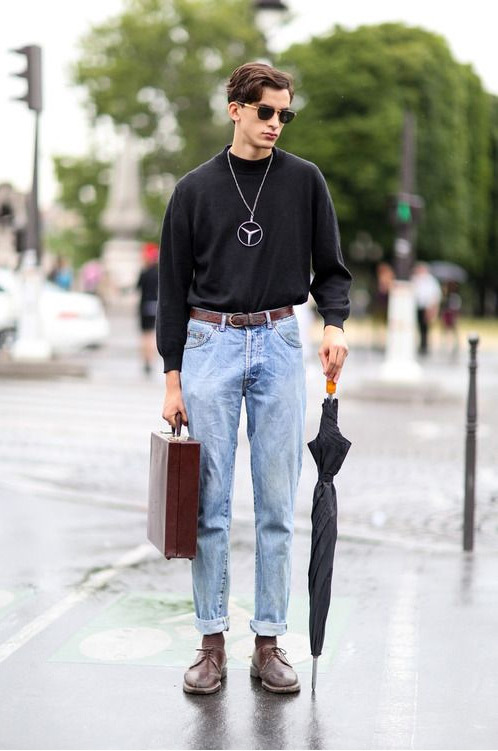 There’s a new trend on the loose: “normcore,” or dressing like somebody’s dad from the ’90s. Please, please don’t dress normcore. In essence, normcore is about dressing like it’s the bad part of the ’90s again. Think acid-washed jeans, schlubby tops and sweaters, white/off-white Keds, ugly tube socks, and maybe Birkenstock sandals. The style icons for normcore, at least as far as I can tell, are quite literally the cast of Seinfeld, a group never known for their good sartorial choices. It’s almost intentionally unattractive, as if to flaunt the style industry in its entirety – likely the whole point. To be blunt, normcore is awful for men and only barely palatable for women. Where womens’ normcore is a strange, perhaps slightly off-putting, variant on the more hipster trends of the late ’00s, mens’ normcore comes off as completely awkward and sexless. The fits are almost universally unappealing, the fabrics often clash, and, quite honestly, no individual piece of a normcore outfit (that I’ve seen, anyway) had much individual merit. Mens’ normcore is, therefore, pretty similar to overalls – awful on men, potentially decent on women. If there is something to be learned from normcore, it is that, in very limited circumstances, fit matters. Fit can bring even the most obnoxiously vintage article of clothing into the modern era. The few times normcore works on women, it works because the fits are excellent and best portray the clothing worn. There’s accordingly nothing inherently wrong with light washes of denim, even if they are slightly vintage – but poor fits will wreck an outfit in virtually every instance. Should you want to go vintage – and, again, there’s nothing wrong with that – you should recognize the risk of your choice. Stick to well-fitting vintage-looking garments that are high quality. Don’t buy faux-vintage junk from Urban Outfitters or similar stores. If you want to rock the light denim look, find a pair of jeans or a jean jacket that fits you like a glove, not a paper bag. If you want to rock a schlubby sweater, make sure it hangs perfectly, and avoid obnoxiously dated patterns like the plague. If you absolutely must rock a vintage suit (usually a bad idea), make damn sure that the more noticeable traits of its age (padded shoulders, huge lapels, etc.) are minimized, and that the clothing otherwise fits to modern tastes. In the mean time, let’s hope normcore dies a quick death.